Machine learning has all kinds of nefarious and trivial applications, but one of the most useful and terrific has been the rise of quick and cheap transcription tools. This tech is slowly but surely murdering the scourge of the unwanted, unplanned phone call. Years ago, Google’s Voice service began the invaluable practice of machine-transcribing voicemails and forwarding them to your inbox. Now, as Google continues to roll out its call-screening tech to Google Pixel devices, the robots are mercifully turning phone calls into text. Google first announced its new call-screening feature at its big annual event, a feature where a friendly robot will pick up the phone for you and politely ask whoever is calling what gives them the nerve to try to reach you on the phone. It’s a twist on Google’s other bot-related project to make the robots call real-life humans on your behalf. 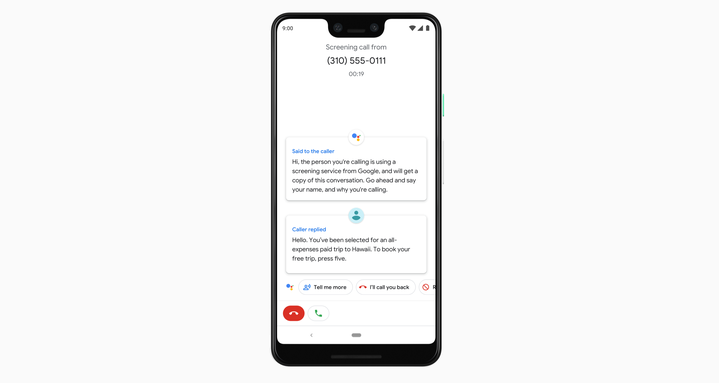 Now, as noted by 9t05Google, a feature that allows users of the screening feature to save transcripts is rolling out to Pixel owners, slowly but surely transforming phone calls into text. If you have a Pixel, you can check for the feature by going to Recent Calls, then Call Details, then See Transcript. Unlike Google Voice, this feature does not turn transcripts into literal emails by sending them to your inbox, at least not yet. The process is far from perfect. As the transcripts show, many callers who are surprised to be talking to a robot will wind up talking over it. That, with the still hit-or-miss nature of machine transcription plus the generally low quality of phone call audio, can result in dialog that is sufficiently garbled as to be only slightly readable, but readable nonetheless. This feature is invaluable when it comes to screening robocalls, but it can be a little more awkward when it catches actual humans in its net, as one Redditor illustrates. But if you’re looking to cut down on unplanned, unsolicited phone calls, maybe that’s a feature, not a bug.